Due to the lack of a formal legal definition of absinthe in the United States, both authentic distilled absinthes and artificially colored, un-distilled absinthe products were reviewed in the same category. With a score of 91, Obsello surpassed all other traditionally distilled and naturally-colored absinthe vertes, making it the clear choice for consumers looking for an authentic distilled absinthe verte. Hand-crafted using the same techniques applied in the early 1900’s, pre-ban era, Obsello is rare in its soft, rich flavor and affinity to original absinthe. It is distilled from eight botanicals, and eau de vie from Penedes Spain with no added food coloring or sugar. 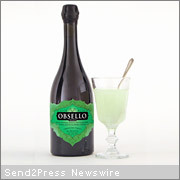 At a time when U.S. consumers are getting bombarded by questionable, sub-par absinthe products claiming to be the green fairy, Obsello is a refreshing return to authenticity and premium quality. The overwhelming positive feedback Obsello has received from bars, patrons, press and critics alike, including the most recent Gold Medal from BTI, is a reflection of rapidly growing affection for Obsello and a demand for real absinthe. Obsello Absinthe is an award-winning, authentic absinthe that is twice distilled with eight natural herbs including grande wormwood, anise and fennel. Hand-crafted in small batches in Europe, Obsello is made in traditional alembic stills using an un-aged brandy base from Penedes wine stock. Obsello embraces original absinthe production, once banned in the early 1900’s, and excludes any artificial flavoring, coloring or essences. With honey and vanilla undertones, a noticeable lack of bitterness, and a hypnotic velour mouth feel, the taste of Obsello stands clearly apart from competitor brands.